by Frances Lennard, Senior Lecturer in Textile Conservation. We are very excited to have begun a new research project in collaboration with Historic Scotland. A camera has been installed in the Queen’s Inner Hall at Stirling Castle to take time-lapse images of the newly woven tapestry, The Mystic Hunt of the Unicorn. The unveiling of the tapestry on 23 June marked the completion of a landmark project for Historic Scotland, the creation of seven new tapestries for the restored Renaissance Palace. 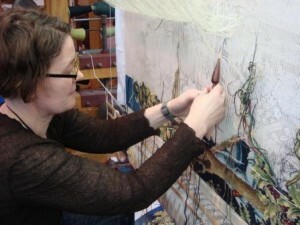 They were woven by West Dean Tapestry Studio, some on site at Stirling Castle, using traditional tapestry-weaving techniques. They are closely based on a set of sixteenth century Unicorn tapestries now in the Metropolitan Museum of Art in New York. 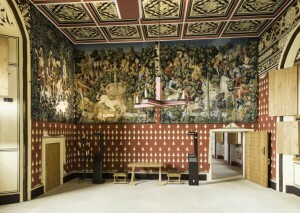 Completed Unicorn tapestries hanging in the Queen’s Inner Hall at Stirling Castle. © Historic Scotland. Weaving The Mystic Hunt of the Unicorn at Stirling Castle. © University of Glasgow. What will time-lapse photography achieve? 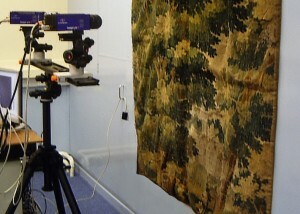 In a previous research project involving textile conservators and engineers at the University of Southampton, we showed that it is possible to employ imaging techniques used by engineers, including digital image correlation, to capture strain data from tapestries. We are keen to continue this work here in Glasgow and would now like to use these techniques to give us information about how a tapestry ages. Monitoring strain – the amount the tapestry deforms as it hangs – will help us to understand the way a tapestry’s structure changes over time. We assume that areas of high strain will be the areas where damage will occur first. We are capturing high-resolution digital images of the tapestry, at the rate of one image per hour initially. Later we can use a computer programme to obtain strain data from the images. The data can be turned into strain maps, a very visual way of identifying areas of high and low strain, especially when the map is overlaid onto an image of the tapestry. In the strain map shown here you can see high strain depicted in red and low strain in blue. Strain monitoring of a tapestry with digital image correlation. This technique uses two cameras and can also give information on three-dimensional deformation. © Textile Conservation Foundation. 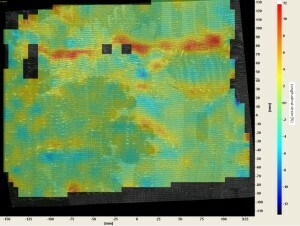 Strain map overlaid on an image of a tapestry, showing areas of high strain in red and low strain in blue. © Textile Conservation Foundation. It is very exciting to have the rare opportunity to monitor a tapestry from the day it was first hung. We hope to be able to continue monitoring The Mystic Hunt of the Unicorn for months or even years, providing valuable data on tapestry behaviour in real time. This will help us to gain a better understanding of historic tapestries made in the sixteenth and seventeenth centuries which survive in historic houses and museums but are now damaged and weak. Ultimately this will help us understand which environmental conditions are most suitable for their long-term preservation, and which conservation treatments will be most appropriate to keep them hanging for as long as possible. We are very grateful to Historic Scotland for making this work possible and to the Textile Conservation Foundation for providing funding for this project. We are seeking further funding to continue the research.